Waste Electrical & Electronic Equipment (WEEE) is the fastest growing waste stream in the UK. ‘WeeeFree Week’ is an exciting initiative to promote recycling of WEEE. 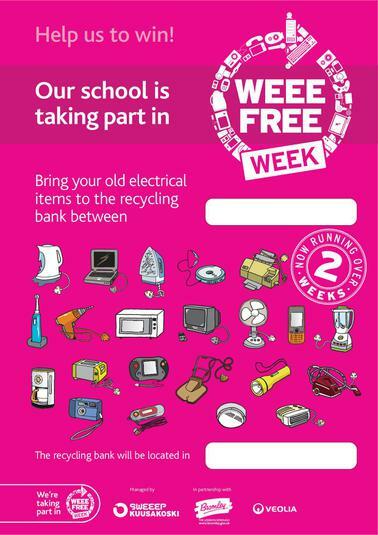 You can recycle old electrical items in the pink skip which will be in Highfield Junior School car park between 22nd February and 4th March 2016. The schools with the highest kgs of WEEE per head will win a share of the £1000**** total prize fund.